Ever feel fatigued and in need of a quick pick-me-up? Does your skin feel stressed and dry? Try this bath bomb. All the ingredients are richly beneficial to skin because it will provide intense moisture, minimize pores, and soothe any irritation. Plus, the lavender essential oil serves as a great aromatherapy. Shea Butter- - Used for hundreds of years. 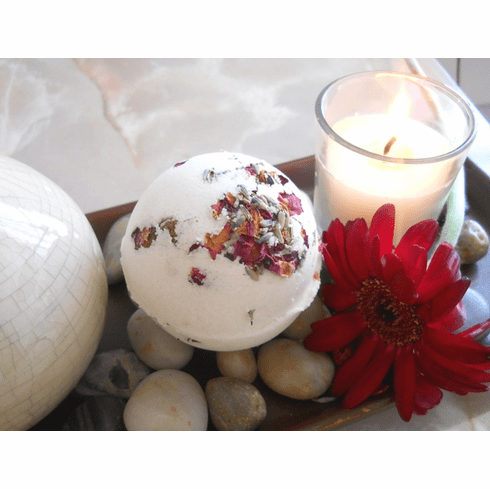 High in moisture and great for rejuvenating skin. Natural sunscreen. Heals burns, abrasions, ulcerated skin, stretch marks, and is great for combating dryness. Avocado Butter- Rich in vitamins A, E, and D. Reduces age spots, sun damage, and scars. Has anti-aging properties and promotes collagen production. Very nourishing and moisturizing. Goat Milk- Very soothing and gentle on skin. High in vitamins B, E, C, A, minerals, fatty acids, and lactic acid. Leaves skin ultra conditioned. NOTE: Does not contain soap. You will not see bubbles only fizzing. WARNING: Due to the high butter content in this bath bomb, tub may be slippery after use. Please be careful!